New York, April 30, 2018 – S&P Global Market Intelligence (SPGMI), a division of S&P Global (NYSE: SPGI), today announced that it is collaborating with Visible Alpha through the company’s ONEaccess platform to aid mutual institutional buy-side clients with tracking and valuing research products and services following the application of the revised EU Markets in Financial Instruments Directive and Regulation (MIFID II). SPGMI will provide key readership data to the ONEaccess platform which enables buy-side clients to better score broker interactions and identify the value of brokers’ research services. SPGMI will deliver research entitlement data to the ONEaccess platform which enables buy-side clients to preview and closely manage research from brokers with whom they do not have a relationship. This will help mutual clients conduct due diligence, evaluate research and manage compliance questions in relation to the MiFID II inducement and research regimes. In the future, SPGMI will also be working with Visible Alpha and sell-side brokers to automate and integrate brokers’ entitlements processes and data to help them assist buy-side clients in meeting MiFID II reporting requirements. MiFID II is the legislative framework regulating investment firms, services related to financial instruments, and venues where those instruments are traded in the EU. The SPGMI and Visible Alpha collaboration aims to help buy- and sell-side meet their MiFID II reporting requirements. At S&P Global Market Intelligence, we know that not all information is important—some of it is vital. We integrate financial and industry data, research and news into tools that help track performance, generate alpha, identify investment ideas, understand competitive and industry dynamics, perform valuations and assess credit risk. Investment professionals, government agencies, corporations and universities globally can gain the intelligence essential to making business and financial decisions with conviction. S&P Global Market Intelligence is a division of S&P Global (NYSE: SPGI). For more information, visit www.spglobal.com. Visible Alpha is transforming the way Wall Street firms collaborate on research, financial models and corporate access events by providing breakthrough tools for discovery, analysis and valuation. With more than 400 employees globally, the rapidly growing company combines advanced data technology, a secure distribution network and sophisticated analytical tools to drive efficiencies and transparency into the research process while also enabling firms to generate alpha in new and differentiated ways. Visible Alpha is backed by the world’s leading investment banks. 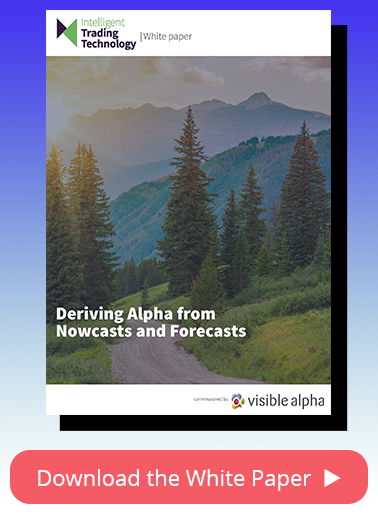 For more information on Visible Alpha, please visit visiblealpha.com. Catch up on all of Visible Alpha's news and announcements on this page. Subscribe so you always stay in the know! Subscribe to the Visible Alpha Newsletter!